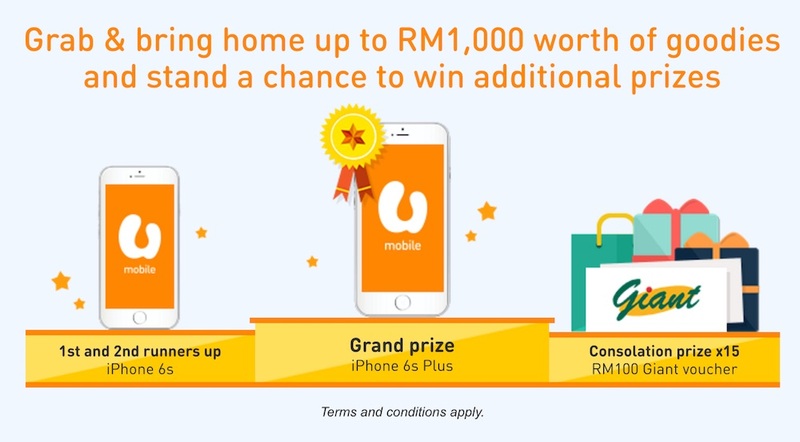 U Mobile’s “Shop Till U Drop” event is back, and it lets you stand a chance to win a shopping spree worth RM1,000, as well as an iPhone 6s Plus. All you need to do is just top up your U Mobile number and you might be one of the lucky winners. Just top up a minimum of RM30 via one of the participating stores and U Mobile will select 18 lucky winners each month. These winners will get a 5 minutes shopping spree at Giant Hypermarket worth up to RM1,000. The participant who gets closest to the RM1,000 cap during the shopping spree will win an iPhone 6s Plus. The first and second runner-ups will get an iPhone 6s, and the other 15 participants will win the consolation prize (RM100 Giant voucher). The most convenient way to top up is via online payment. The participating online stores include MyUmobile App, U Mobile Online Store, WeChat, Justbuy.com.my, Qoo10.my, and Youbeli.com. You can also purchase your top up via e-pay, retail outlets, MOL, and more. Check out U Mobile for the full list of participating partners. This contest is open to all U Mobile prepaid subscribers who purchase U Mobile reload of not less than RM30 in a single transaction. You must use the reload amount to be entitled to join the contest; each reload that you use will be entitled to one entry to this contest. The 18 winners will be selected based on every eight hundred and eighty eighth (888th) transaction in a month. If you are one of the lucky 18, you will be allowed to bring one partner to assist you in the 5 minutes shopping spree event. Rumour: Is Apple Planning to Open an Apple Store in Malaysia?